This is the website of Pepijn van den Nieuwendijk, painter, sculptor (ceramics) and illustrator. 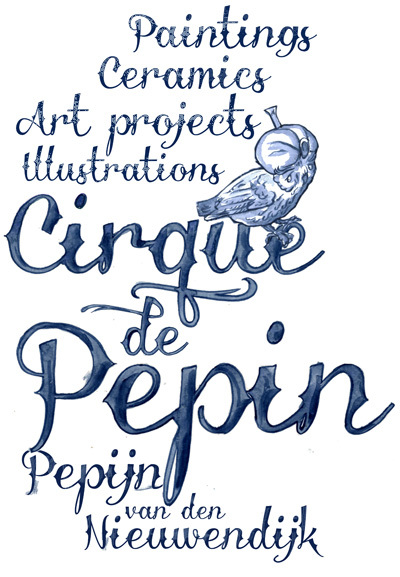 The Cirque de Pepin studio is located in Den Haag (The Hague), The Netherlands. If you have any comments or suggestions, or if you want to know more about the availability of the artworks, Pepijn loves to hear from you! You can contact Pepijn by email or with the contact form at the bottom of this page. Gallery Untitled is located in the creative Rotterdam North. Untitled represents contemporary work by various artists. These are both established names and young talents. The various art forms regularly mix with performances and literary lectures. Nasty Alice shows contemporary art and ceramics. We are courageously outspoken and innovative: we don’t follow, we renew. Gallery Nasty Alice is the place to discover emerging young talent in combination with established names. As an art producer Mothership curates, advises, mediates, supervises and produces when it comes to art projects. Using art Mothership creates added value to public space, both indoor and outdoor, as well as to buildings. Organizations and artists both benefit from this in a special way. Mothership’s mission is to bring art to the people. By adding art in public outdoor space Mothership makes art accessible to everyone. The Amsterdam based KochxBos art gallery is the first independent North-European low-brow / pop-surrealist gallery. We nowadays call it Contemporary Underground Art. ‘Lalanta’ is translated from the Thai word meaning “beauty in abundance”. Located in the heart of Bangkok’s most affluent districts, La Lanta Fine Art offers contemporary artworks by internationally acclaimed artists. The gallery also exhibits work by up-and-coming artists.